It’s the seasonal coffee-making challenge: You’ve got a houseful of holiday guests to entertain and a coffee maker that brews only a dozen cups at a time. You could make pot after pot in a frantic effort to keep the java flowing. 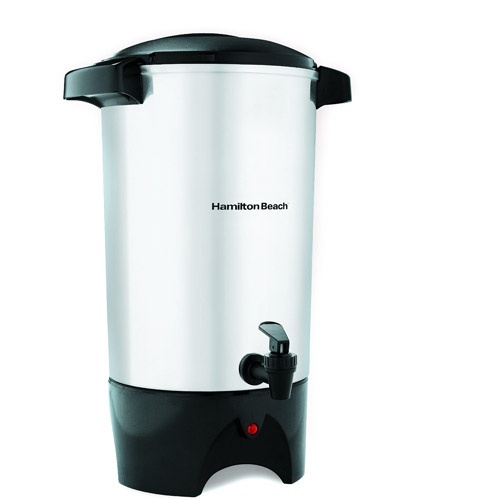 Or you could just buy a coffee urn. A what? You mean those giant, 1950’s percolators? Good grief! You *do* mean it! Are you mad? Is this the Rupert Murdoch influence already manifest? Java snobs tend to spurn percolators, saying that the constant contact between the heated water and the coffee grounds results in a bitter taste. 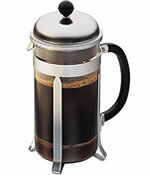 Unfortunately, you aren’t likely to find a French press that can do an urn’s job. Spurn them? We despise them! And so does anybody who has to drink the coffee that they make. It’s stunning technology, isnt’ it, that can make coffee both remarkably bitter, but weak, too? And while a single French press won’t do the job, several will. In fact, they’re an extremely elegant way to set a holiday coffee service. Rather than a big ol’ urn full of weak, bitter and overextracted brew, set out half a dozen coffee presses, each with a different origin. Offer your guests a virtual tour of the coffee world, from the smoke and earth of Sumatra to the jasmine flower and berry of Ethiopia, the brisk, clean cups of Costa Rica and Panama, to the winey, powerhouse coffees of Kenya. For good measure, throw in a dark-roasted, high-grown Guatemalan bean and the clean, classic, island flavors of America’s own coffee origin, Kona. I took the kids to the local bakery for breakfast yesterday – sort of a “while your mother is out of town” treat. Nothing calls for coffee quite like a donut but the bakery makes their coffee in one of those commercial urns. The first sip was quite a shock. Everyone should taste percolator coffee once every few years just to remember what an horrible cup they make. I remember my Grandma telling that when she was working as a waitress free refills of coffee were never expected. I’d venture to say that with percolator quality being the norm they were not wanted either. I remember my Grandma telling that when she was working as a waitress free refills of coffee were never expected. I’d venture to say that with percolator quality being the norm they were not wanted either.